CELEBRATION TIME! In the recent Landscape Industry Association of WA’s “Awards of Excellence 2018” we received the prestigious design award in the category “Designer – Residential – more than 500 sqm”. This award was for our Landscape Design on a new home in Madora Bay. This was one of those projects where we clicked with the clients immediately. We love helping people transform their outdoor spaces. We believe a well thought design presents the chance to get all the puzzle pieces working together. 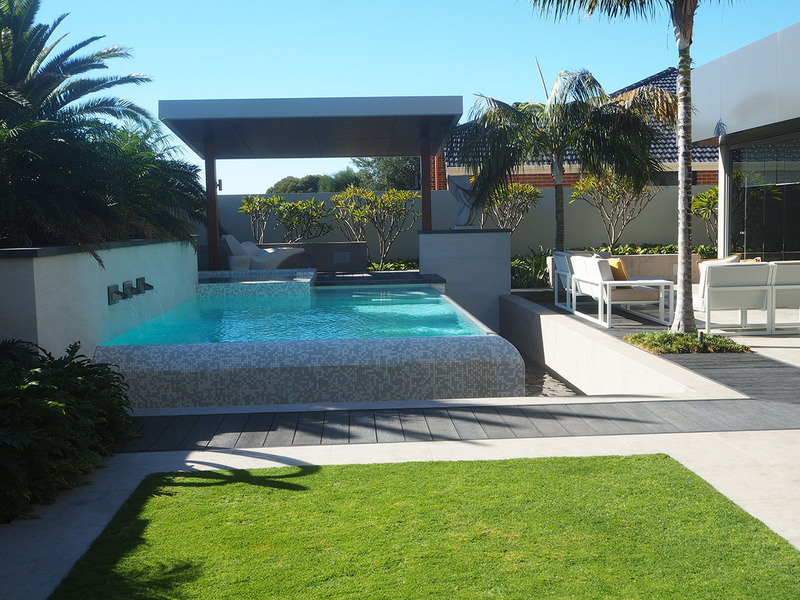 Not only that, on this project, we also enjoyed working closely with the architect Ilias of Illiades & Associates Pty Ltd and the builder Todd Green of Mandurah Homes. Initially Mondo Landscapes design brief was to provide a planting plan. Our clients loved elements of their existing garden and wanted their new home to feel surrounded by beautiful gardens. As the project evolved we became involved with the design of the pool and spa area, tile selections, materials and finishes around the home. It is the final details that really count when it comes to creating a distinctive landscape that stands out from the crowd and makes a lasting impression. As with all projects the front of the house is the beginning. Located very close to the coast, the weather and salt laden salt laden winds can be extreme. Raised garden beds allowed for layers of planting complimenting the architecture of the home. We recommended plants for their toughness and with some height variations, however without block views. Two years on it was very rewarding to see the garden thriving. A very steep driveway can often be hazardous. Mondo specified Eco Outdoor’s hardwearing filetti natural stone; long, thin peices of natural stone giving great traction for vehicles and people. Filletti is a traditional stone paving found throughout Europe. It is amazing that an ancient material works harmoniously with the modern architecture and palette of this home. Large steppers made from filetti, offered texture contrast with natural stone cobble. 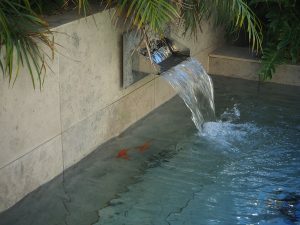 The ultimate in luxury statements the custom designed concrete pool. In our opinion, there is no doubt, the pool area is the hero of the home. The custom design and materials selected by Mondo Landscapes contributed to the judges awarding this prestigious design award. Visually compelling is the fully tiled rolled negative edge on the raised pool, complimentary white mosaic tiles are used on both the pool and spa. We love white tiles as they give a pool the aqua lagoon appeal. The clever combination of raising the pool and incorporating a reservoir means an isolation fence is almost completely avoided. Large format tiles on the raised garden bed, capped with a rebated blue stone allows for concealed lighting to wash down the raised planter wall. Mondo worked closely with Pools By Design to ensure the integrity of the design reached its full potential. Their workmanship on the pool was outstanding. The porcelain tiles used outside matched the natural stone Juro Blue inside perfectly. Black composite deck between the porcelain tile and pool reservoir presented a noticeable texture change. Above all, we felt this created a visual alert near the pool reservoir, warning guests of the level change. Along with specifying all plants in the landscape design, we put our boots on and sourced them too. We felt like “The Planhunter” exploring nurseries. Each day was an adventure selecting the perfect plant for each location. Mature architectural plants were used in the landscape, together with a soft palette of foliage in the under story. The use of so many architecture plants could be overpowering. However, the result here is outstanding, giving the appearance that the garden has been there forever. Craned onto site were three massive date palms. Transporting and planting these on the verge was a massive undertaking. They are extremely visual from within the house and courtyard, giving a great resort ambiance to the pool zone. Neighbours got a big surprise, returning home from holiday one evening and thought they had turned into the wrong street. We all thought this was very funny. The pool courtyard is adjacent to the main living area of the home. It is incredibly visual from inside and we wanted to ensure the clients felt that the garden was an extension to their living area. Inviting them to enjoy the outside all year round. Garden lighting enhanced the outdoor space and home, it is an integral part of this design. Clever use of lighting enhances the nature stone, as well as, highlighting the textures and plants throughout. Striking modern architectural lines dominate this home with views to the ocean and into the garden. Every aspect of the landscape design has been well considered. Receiving this prestigious design award in recognition of the attention to detail is the icing on the cake. As designers we believe that a well designed space can have a marked effect on the people that live in that space. From every aspect this garden is connected to the house inviting the owners to enjoy an outdoor life.